The main difference between program files and program files x86 is that 64-bit applications are installed into program files folder while 32-bit applications are installed into the program files x86 folder. In 64 bit Windows OS, we can see two types of folders in the C drive. These are program files and program files x86. 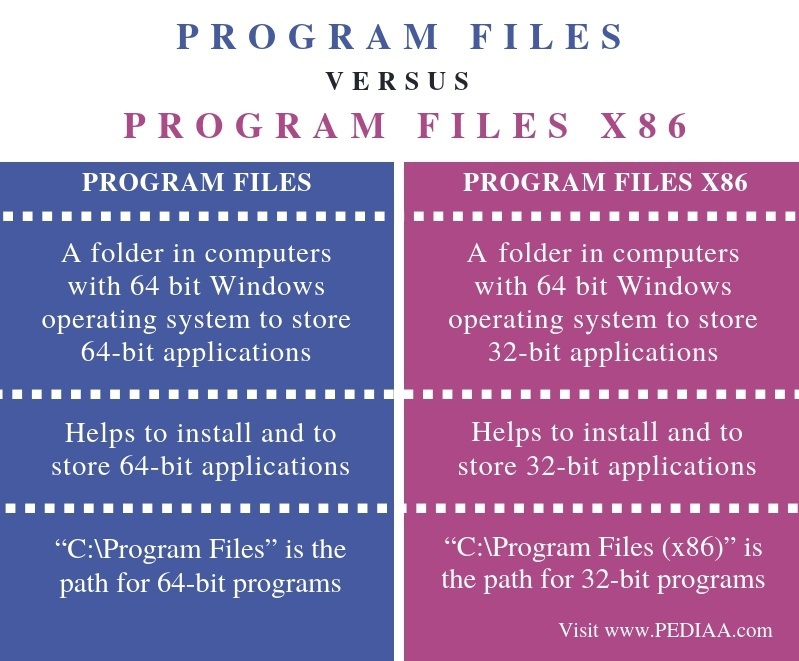 This article examines the difference between program files and program files x86. In a 64-bit Windows OS, the 64-bit software is installed into the program files folder. This OS provides the ability to execute both 64 bit and 32-bit programs simultaneously. It is capable of running 32-bit applications using an emulator layer. The 32-bit applications are installed into program files x86 folder. The purpose of having these two folders is to provide backward compatibility. In other words, it allows executing 32-bit applications smoothly without any issue on 64-bit machines. Furthermore, storing all the files in the same folder will make it difficult to access the files. Therefore, the 32-bit software is installed into this separate folder. Program files x86 folder is only available on 64-bit windows operating systems such as XP, Vista, 7, 8, 10, etc. If this folder is available, it indicates that the computer has a 64 bit Windows operating system. As the applications are in two separate folders, the OS can understand the configuration to use for a specific program. Moreover, there can be both 32 bit and 64-bit version of the same program. Program files is a folder in computers with 64 bit Windows operating system to store 64-bit applications. Program files x86, on the other hand, is a folder in computers with 64 bit Windows operating system to store 32-bit applications. This is the main difference between program files and program files x86. Program files folder helps to install and to store 64-bit applications whereas Program files x86 folder helps to install and to store 32-bit applications. “C:\Program Files” is the path for 64-bit programs while “C:\Program Files (x86)” is the path for 32-bit programs. This is another difference between program files and program files x86. The main difference between program files and program files x86 is that 64-bit applications are installed into program files folder while 32-bit applications are installed into the program files x86 folder. In brief, these two folders are available to support backward compatibility. 1. “Program Files.” Wikipedia, Wikimedia Foundation, 17 May 2018, Available here. 2. “Encyclopedia.” PCMAG, PCMAG.COM, Available here.